In the early 1800s, the popularity of “water dogs” spread across America and eventually right across the globe to England. These water dogs were working closely with hunters. They were praised for their unmatchable retrieving abilities, particularly when in water. Their services were not dependent on weather conditions so they could perform all year round. Eventually, they became known by the name we call them today: Labrador retrievers or “Labs” for short. Today, Labradors are some of the most loved domestic pets on the planet. Because of their interesting pasts and the consequences of breeding, their lifestyles require a bit more thought than other dogs. This affects everything from exercise patterns to dietary requirements. This guide will break down the ins and outs of Labrador existence. You can see what matters when looking after your four-legged friend. 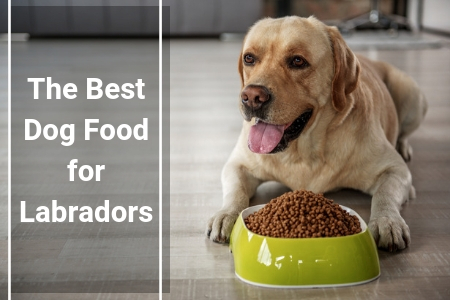 We also listed our top five best dog foods for your Labrador retriever along with pros, cons, and reviews of each. In spite of originally being bred for water retrieving, Labradors are today’s family dog of choice. They are fiercely loyal, energetic, and loving creatures. Labs particularly love having jobs to do. Whether it’s retrieving something thrown or playing watchdog, they take their tasks very seriously. This is not to underestimate their playful nature. And, in spite of being of incredible muscular stature, they are unbelievably gentle when need be. This makes them the perfect family dog. They are popular worldwide as their anatomy allows them to thrive in all weather conditions. From the coldest cold to the warmest corners of the globe, Labs can fit right into your home dynamic without much fuss. Because they are so strong, however, there needs to be a distinct balance between diet and exercise. A lack thereof and you’ll notice their energy shift beyond their own control in sporadic outbursts. Labradors are also prone to becoming overweight if food portions are out of balance. Regardless of the breed, dogs across the board need a balanced diet when it comes to feeding time. The first and most notable ingredient is that of carbohydrates. Carbs make up 50% to 70% of most dog foods. Manufacturers typically source their carbs from wheat, corn or barley-based grains. On occasion, you’ll find potato-carb-based dog food. Carbs are imperative for the digestion of your Labrador. They’ll also get most of their expendable energy from these. Carbs are solely responsible for the active nature and energy levels of an animal. Dog food also needs a significant amount of protein in order to constitute as balanced. Protein is solely responsible for the building of muscle and tissue within your pet. Because Labradors are naturally such muscular creatures, sufficient protein is extremely important. It’s also important that the added protein comes from a natural source of meat such as chicken, beef, or fish. Labradors need 18 to 20% of protein per meal. Lastly, a combination of vitamins, minerals, and fatty acids should make up the rest of the food mix. These are all responsible for your Lab’s immune system upkeep. They ensure the body continues to function normally and prevent illness. Enough vitamin A and zinc are essential for Labradors due to the dense nature of their coat & skin. The vitamins and minerals found in dog foods are taken from fruits & vegetables. This is the same way in which human beings receive their vitamins and minerals. Most people go through life remaining blissfully unaware about the difference in foods when it comes to bigger versus smaller dogs. The misconception that dog food is dog food is dog food can be detrimental to the health of your pet. In actual fact, dog food requirements are vastly different for different breeds and sizes. Labradors would be categorized as a large breed when it comes to dietary habits. Unlike their smaller counterparts, bigger dogs need more of the aforementioned nutrients per meal serving. Their physical anatomy requires more in order to function properly. That being said, bigger dogs also tend to consume larger portions of food during meals; usually, up to three times compared to that of smaller dogs. This means that the nutritional value per kibble pellet needs to be proportionate to the size of the serving they’ll consume. High-quality dog food manufacturers carefully balance the nutrient values of each pellet targeted at bigger dogs. Because more quantity will be consumed, nutrients per pellet are significantly less than in food targeted at smaller dogs. Because smaller dogs can’t eat as much as bigger ones, the nutrient value needs to be much higher. This ensures that the animal gets enough per serving to maintain their health and well-being. Smaller dogs also need smaller pellets since their jaws and teeth can’t manage the same sized pellets that bigger dogs would consume. This contrast in food is so important to be aware of if you are a dog owner. Feeding your small dog (or puppy) food that was designed around the needs of bigger dogs can lead to deficiencies quickly. 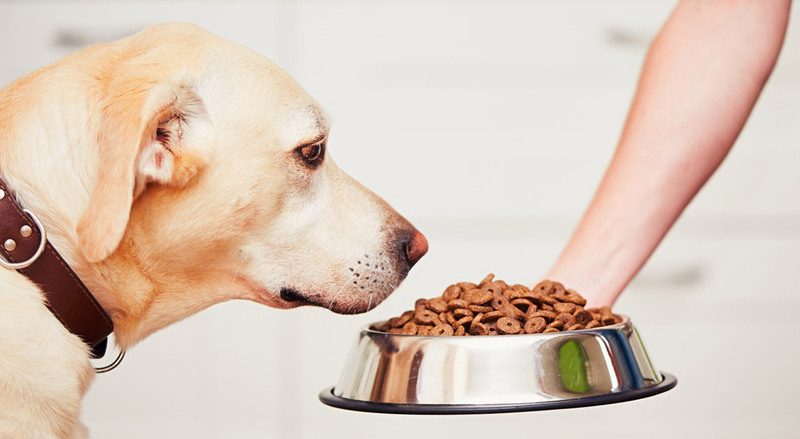 In the same way, feeding your bigger dog food targeted at smaller dogs can see them receiving too much of certain vitamins, minerals, fats, and carbs, which can be bad for their health. Making oneself aware of the repercussions that come with bad dietary management and making adjustments can mean the difference between a healthy, thriving dog and a deathly ill one. It’s all in the food! Falling under the category of “bigger dogs,” Labradors need a higher amount of nutrients per serving. Labs should ideally be fed twice a day. This is a lot when you consider the idea of eating dry food so frequently. Their digestive tracts can take some strain. It is, therefore, encouraged that dry food occasionally be mixed with a topper of sorts. Broths and meaty chunks are a great way to spice things up. Throwing in some raw meats on occasion is also a nice change which will keep mealtimes interesting so they actually WANT to eat and you don’t have to force them. Taking an interest in the dietary requirements of your Labrador poses many advantages to everyday life. Some of the quality dog foods on the market have the ability to transform your pet’s life quite dramatically. If your dog could talk, we guarantee he would thank you. It might sound like a cliché, but if a happy pet isn’t the long-term goal then what are you actually doing? Selecting the best dog food for your Labrador can set this path in motion. With dogs, life is really about the simple pleasures—meal times are one of them. Each one should be as tasty and enjoyable as possible. Eating a quality, balanced food source will show instant results in your Lab. Their exterior and interior will be in peak performance & their mood will match. Did you know Labradors are prone to depression? This is easily managed, however, with enough exercise and sufficient nutrients entering their systems each day. Hand in hand with happiness, great Labrador health is probably the most worthwhile benefit of a proper feeding regime. No one wants to think about their dog no longer being around. Something as simple as investing in quality dog food can significantly increase the lifespan of your pet. What’s more, while eating nutrient food they’ll be less prone to illness and disease, meaning less time in the vet’s office. This gives valuable peace of mind that is worth the price tag of properly designed food alone. However, this large breed is prone to food allergies, hip dysplasia, and even obesity in adult dogs. Therefore, dog food for Labradors that is specially formulated to controls the number of calories in the dog's diet, and provides a wellness core, such as raw food, grain-free dry dog food, a balanced fat content, probiotics, and so on will make for a happy, healthy pup. In order to keep certain breeds of dogs in a thriving state of existence, there needs to be thought and care from the owners in question. The nature of dog breeding sometimes sees the emergence of flaws within the development of certain breeds over time. A good example would be the slow deterioration of breathing ability in pugs throughout the years. It’s believed that problems like these arose over time as a direct result of poor nutrition. In order to prevent the same kind of changes in Labradors, it’s the public’s responsibility to become acutely aware of the dietary requirements of these boisterous creatures. Meat vs. Kibble Dog Food - Which Is The Best? There is much debate on whether or not it’s better to feed Labradors a diet of kibble or a diet of solely raw meat. We believe the answer lies in a healthy balance between the two. A raw meat-based diet can be sustainable for Labradors; however, there are certain nutrient groups that would then need to be given via supplements. A piece of meat has more than enough protein to keep an animal going. It does not, however, contain any of the necessary carbs and minerals that contribute to a balanced existence. This is why alternating between both meat and kibble-based feeding can be most beneficial. Too much dry food can also be harsh on the stomachs of Labradors. Their digestion can weaken if meals are not regularly offered in variation. Kibble is perfectly suitable with the addition of a raw piece of meat thrown into the works every few days. The meat piece doesn’t necessarily always need to constitute a full meal; even a bone to snack on is sufficient. Now, to make sure the food you provide adheres to the guidelines mentioned above, consider these options. Freeze-dried foods are interesting because they seem to bridge the gap between dry kibble and wet foods for dogs. 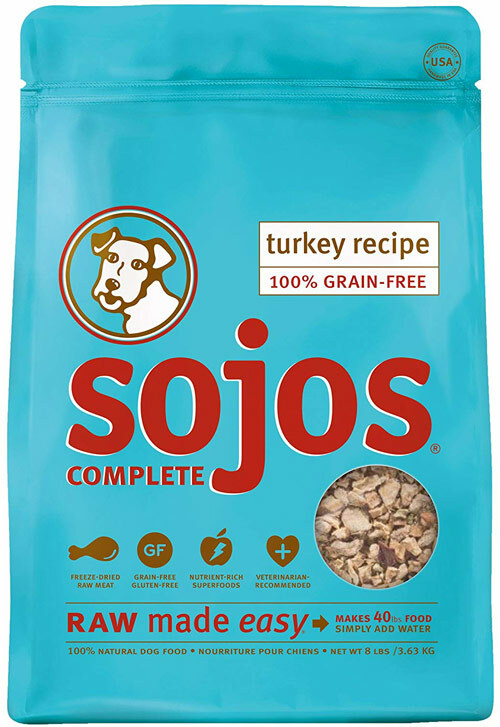 By simply adding water to this instant meal by Sojo, your dog will enjoy a fresh, hearty dinner in a matter of minutes. The experience will be very different compared to serving straight up dry kibble. Sojo doesn’t include any preservatives or genetically modified ingredients in their manufacturing process. These meals also offer an impressive 40% protein level. When served twice a day this is more than sufficient for daily dietary requirements in Labradors. Freeze-drying is also sometimes known as air-drying. In spite of being high in protein, the Sojo range is also comprised of a significant amount of air-dried fruits and vegetables that are added to the mix. 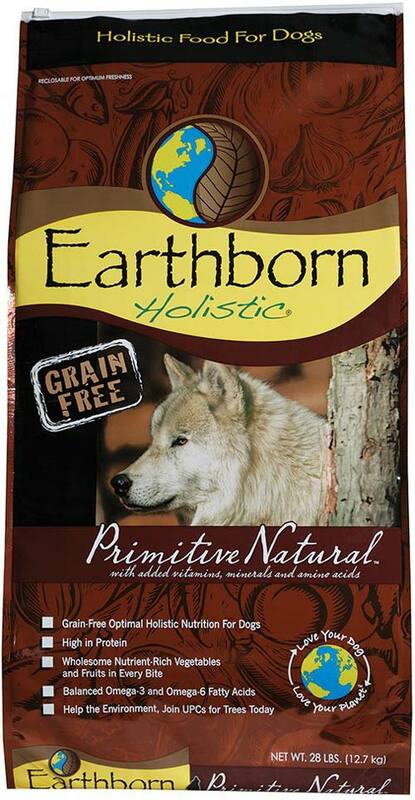 We love the dog food ranges from tried and trusted brand Earthborn. They pride themselves on being a holistic food provider within the dog food market. This dog food is targeted at dogs 50lbs. and up, the ideal formula for grown Labradors. This is one of the most balanced dog food compounds we were able to find on the market. Everything is perfectly weighted, from the fatty acids to the minerals there is a perfect balance of everything a growing Lab needs. Earthborn adds additional omega-3 and omega-6 fatty acids for lipid balance. This is imperative for Labrador development due to the nature of their skin and coats. The compilation of fruits within this brand is also well worth mentioning. From blueberries to peas to spinach, this range of natural produce is not often found in food for bigger dogs. We love the broth ranges from Fruitables. This is one of the easiest ways to take regular dry kibbleand make it a bit more exciting. Simply pour this broth over pellets and let the flavors & nutrients sink in. In spite of being all broth, the product is packed with protein, vitamins, and natural fats to provide a more nutrient-rich experience with every meal. Wetting kibble also makes the meal much easier to digest. It’s always a good idea to alternate between dry and wet meals so that your dog’s stomach experiences the variety and his system gets used to handling both. 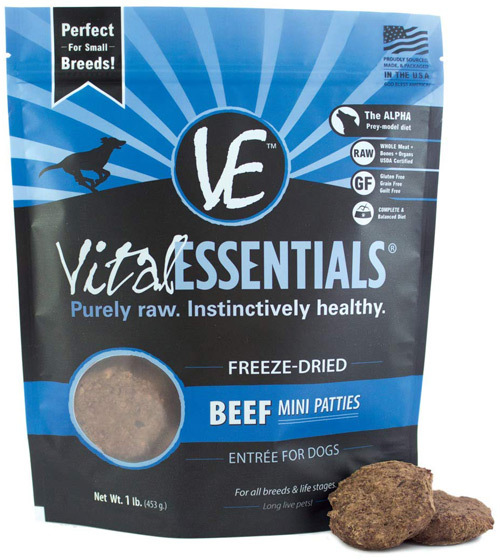 This range by Vital was made with alpha dogs in mind. Your Labrador will enjoy the sensation an allmeat-based meal while still receiving sufficient nutrients per serving. If you so desire, they are also perfectly suitable to be used as treats instead of actual food. The patties are bite-sized. These dried patties are made from real meats and are packed with protein. The benefits of regular consumption of these will be evident in the skin and coat of your Labrador. They are one of the only gluten-free dog foods on the market. Gluten is not usually a concern among pet owners; however, there is growing evidence to suggest it’s not necessarily good for regular consumption amongst bigger dogs. These dog food rolls are welcome alternatives to typical canned dog food. Canned foods are notoriously bad for dogs as the contents tend to absorb the toxins of the metal over time. This roll of food can be served as a meal on its own or added on top of dry pellets for a heartier experience. Each roll contains a balance of fats, carbs, proteins, and minerals for a nutrient-rich experience. The rolls are flavored which makes them the perfect meal for picky eaters. Natural Balance dog food rolls are regularly recommended by vets as the meal of choice for when a dog seems to have a lack of appetite. Raising a Labrador is both a challenge and a privilege. By simply selecting a well-designed, balanced food regime you can guarantee years of happiness and loyalty from your best friend. We trust that this guide has put you on the right path in doing so. Allow yourself to reap the benefits of a healthy Labrador as your companion. Education on food groups and intake is the first step to a better relationship with your dog. A little bit of research goes a long way and there are ample dog food brands out there to help you along. As within, so without. Take care in what you’re putting into your Lab. They’re worth it! 7 Meat vs. Kibble Dog Food - Which Is The Best?